In a food processor, chop cilantro, parsley, olive oil, garlic, vinegar, and hot sauce until herbs are finely chopped but not pureed. You can do this step by hand if you do not have a food processor. Just make sure you finely chop the herbs as well as you can. Add salt and pepper to the sauce and additional hot sauce if desired and stir. Rub half of the chimichurri sauce on the skirt steak reserving the rest of the sauce. Salt and pepper the steak well. Grill the steak for 4-5 minutes per side. Remove from the grill and slice thinly. While steak is grilling spread chips evenly on a rimmed baking sheet or a shallow dish. Add mozzarella and cojita cheese and bake in the upper third of the oven for 6-7 minutes or until cheese is melted. Remove from oven and top with steak and remaining chimichurri sauce. Living in south Florida, there’s a strong Latin community here and man do they know how to cook. My friend had us over for dinner and made steaks with a chimichurri sauce that was out of this world, and ever since then I’ve been finding ways to put chimichurri sauce on everything. What’s next on the list to try it on? Nachos. 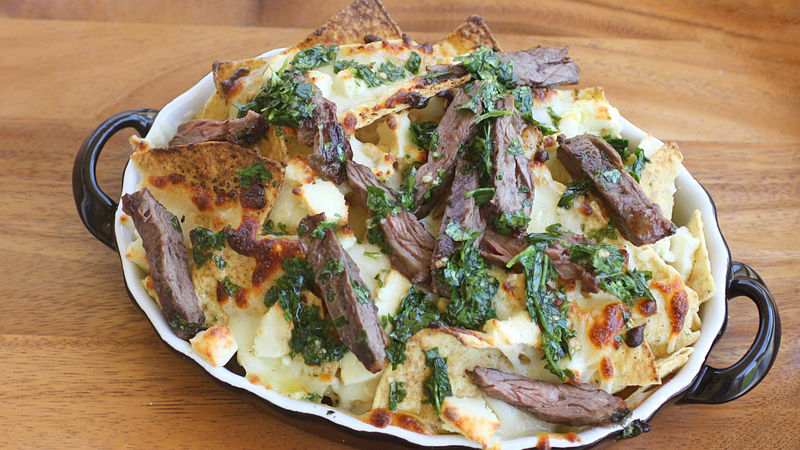 These Chimichurri Nachos start off with lime flavored chips topped with melted mozzarella and cojita cheese. Grilled skirt steak is layered on top and drizzled with chimichurri sauce. What exactly is chimichurri sauce? It’s made out of chopped cilantro, parsley, garlic, vinegar, hot sauce, and olive oil. You can chop it all up by hand, but I find it easier to use a small food processor to do the work. A couple pulses later it’s done. Do NOT over puree it or it will look like a green pea sauce. Usually it’s eaten over skirt steak but I’ve been know to drizzle it over grilled chicken and even dip slices of bread in it. Here’s what it should look like rubbed on the skirt steak before grilling. As soon as I smelled the melted cheeses, steak, and fragrant chimichurri sauce, I knew I had a winner. The best part is that it can be made as an appetizer or a meal in under thirty minutes.